The Sr. UOL Chapter of Sts. Peter & Paul, Carnegie, PA was formed in 1956 followed by the forming of our Jr. UOL Chapter in 1960. OUr chapter quickly became active on all levels of church life, local, regional and national. OVer the past six decades the UOL Chapters have excelled in fulling the Mission of the UOL and upholding its motto: Dedicated to Our Church; Devoted to its Youth. Below are some of the current activities of our Chapter. Pysanky Sale: Our Pysanky Sale has evolved over the past 50 years into a regional cultural event that has become an annual tradition for individuals and families throughout the tri-state area. While origianlly a fundriaser, the sale and its ancillary events have come to also promote cultural eduation and the Orthodox faith. The sale helps to fund the Chapters activities and ministries as well as funding the the ministries of other parish organizations. Subsidizing office related fees: PO Box fee, bulk mail permit, etc. Ministries Committee: Provides Christian ministries for the parish and community. Activities include: replenishing booklets, pamphlets, magazines for Orthodox info racks, providing the parish with Orthodox Study Bibles for new members, maintaining a book mobile, $5.00 luncheons where the proceeds provided to a charity on a yearly basis [2016 was FOCUS Pittsburgh, 2017 will be St Andrew's Society, 2018 is FOCUS Pittsburgh]. Donations are given on average to about 12 other parish, local and national organizations each year. Coffee Hour: The UOL has sponsored a weekly coffee hour for the past 40 years. The chapter views this activity more as a ministry than a fund raiser as each chapter member in liew of paying membership dues hosts a coffee hour. During this past year a number of non-chapter members have joined to help with this ministry. Ukrainian Food Festival: Almost 20 years ago the Chapter teamed up with the Kitchen Workers to sponsor a food booth on the mall during the Carnegie Arts and Heritage Festival. Once the Carnegie Festival ceased we continued this activity as our own food festival in our parish hall. Thanksgiving Dinner: 28 years ago the Chapter began the Thanksgiving Dinner Open House which invites anyone form the public to attend. The event quickly became so popular within hte parish that it became a parish sponsored event that the chapter supports. We distribute on average 200 meals a year. 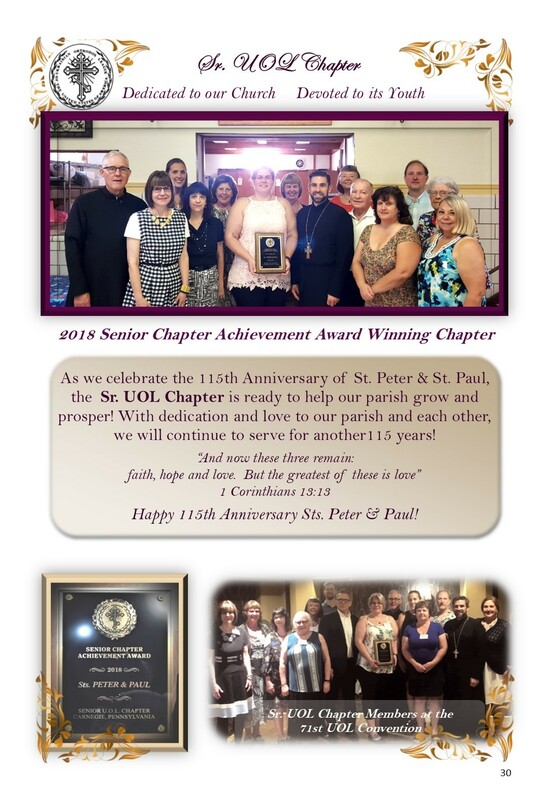 Parish Museum: The Chapter founded the Sts Peter & Paul Museum & Archives 30 years ago. The Museum's purpose was the preservaiton and propagation of parish history and Ukrainian culture. After a hiatus the Museum has reorganized and is once again active. The Ukrainian Orthodox League has announced the Essay topics and information for 2019. Winners will be announced at the UOL Convention in July 2019. Essays are due postmarked by April 30th. Ukrainian Orthodox League of the USA (UOL) is an auxiliary organization of the Ukrainian Orthodox Church, formed by the seventh Sobor in 1946. The major purposes of the UOL include the development of better knowledge and understanding of hte Ukrainian Orthodox Church; encourageing youth interest and participation in the Church; publishing and distributing educaitonal materials; promoting religious, cultural, and social activities and programs; promoting by every means possible hte growth and development of the Orthodox Church. Major projects of the Senior UOL include administration of Metropolitan John scholarhips for seminarians and clergy; awarding the Lynn Sawchuck-Sharon Kuzbyt scholarships for Juniors; planning educaitonal activities including conferences, seminars, and lectures; sponsoring programs for pre-teens and their parents; sponsoring week-ends for young adults to gather; promoting missions activities in local parishes and communities as well as aid programs for communities in need in Ukraine and elsewhere in the world. The offical publication of the UOL is the UOL Bulletin, available online. The UOL also publishes a variety of religious and cultural educational materials. Providing opportunities for the development of leaderships skills and responsibility among the youth of the Ukrainian Orthodox Church of the USA. Providing and promoting informaiton on Ukrainian heritage and history to the general public and establishing means which ensure the continuation of cultural awarness and pride within our membership. Follow along with the 71st UOL Convention with the UOL Facebook page at the following link. The opening of the 71st UOL Convention: Business Session I shows pictures of welcoming remarks by John Holowko, Senior UOL President, Orest Mahlay, Junior UOL President, the Convention Body and Board.